We can supply and set cloths, overlays, napkins, chair covers, and chair sashes from a huge range of colours to perfectly match your intended colour scheme. When we provide the bar area for your event, we do not penalise you with a corkage charge. As well as being able to provide you with bar units and bottle fridges, we can also fully stock and run your bar – providing glassware, plastic glassware, real ales, beautiful wines, and bar staff. 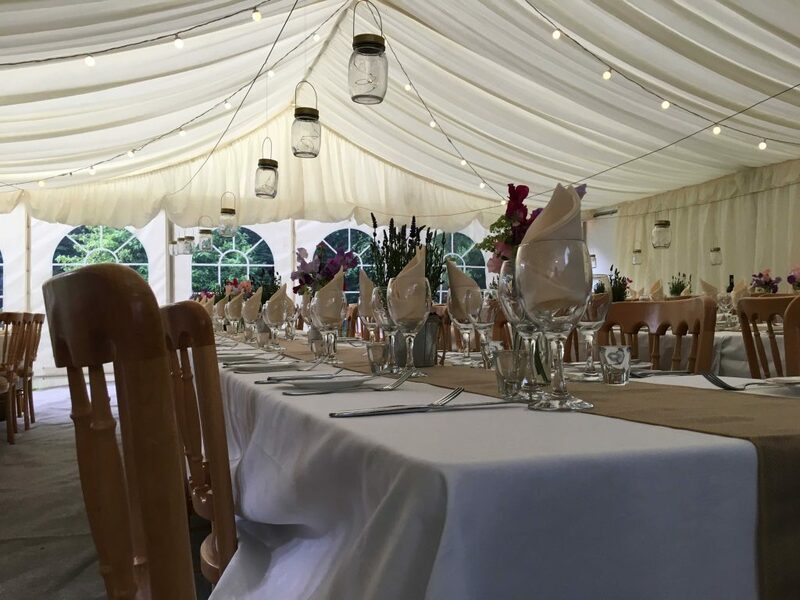 Once the furniture in your marquee has been set out, we can lay your tables and create individual place settings, favours, and table names or numbers. We can provide or recommend the perfect florists to fill your marquee with an incredible visual impact and scrumptious scents. Pollen free options are also available. Metres of beautiful, handmade bunting, created from Cath Kidston cotton, will add a pretty, country feel to your marquee. 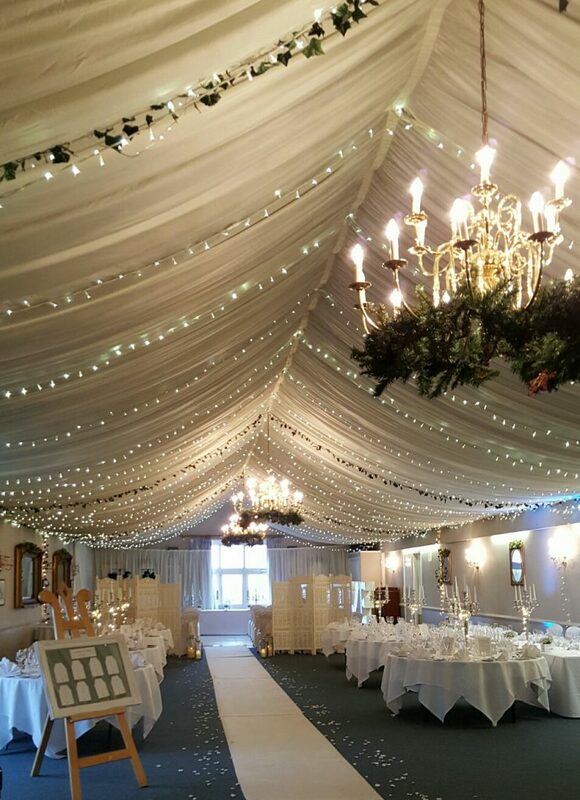 Lengths of extra wide satin ribbon suspended from the ceiling of the marquee in your chosen colour can break up the ivory and delicately incorporate your colour scheme into the marquee. 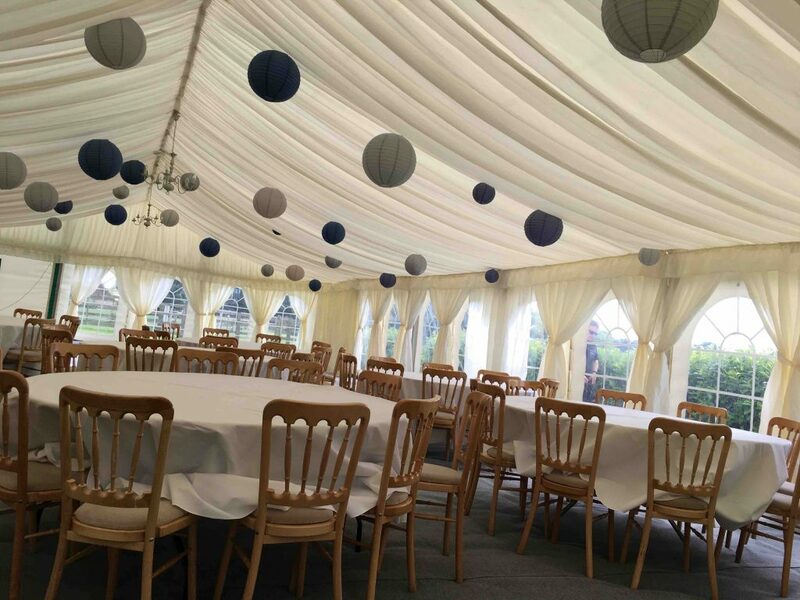 Deep sashes of fabric, in a colour of your choice, add that truly spectacular finish to your marquee. We have two systems available, according to your requirements; a small portable unit which has an inbuilt CD player and Ipod hook up, complete with microphones to use for your speeches, or a larger disco system including two CD players, Ipod hook up, microphones, large high quality speakers, plus beat sensitive disco lighting. Should your marquee site not be near an outside power source, then please do not worry as we can help you to calculate how much power you will need (for lighting, music, catering etc) and provide silent running generators according to your requirements, along with cabling and power distribution panels. 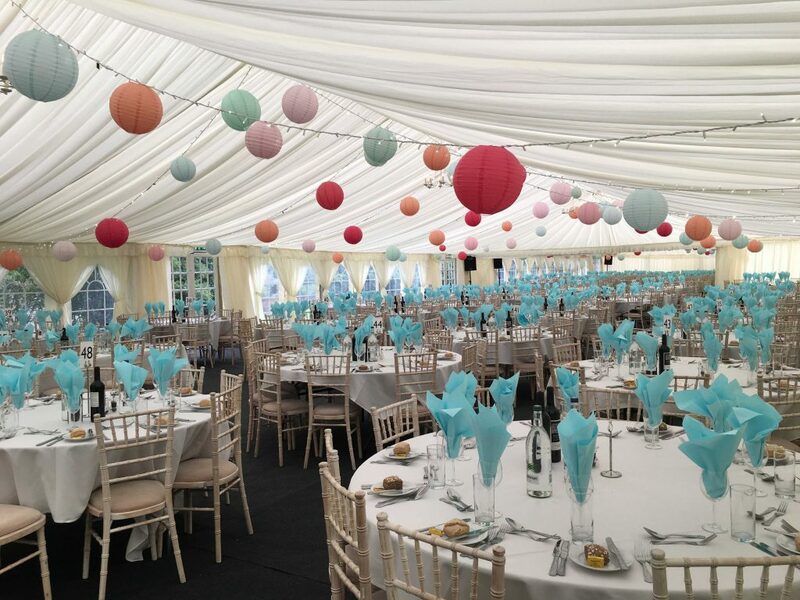 If you require a marquee outside of the ‘normal’ British summertime then we can provide you with thermostatically controlled heaters to ensure that you and your guests are able to enjoy your event, whatever the weather. Our luxury washroom trailer units are available in two sizes (one gents and one ladies, or two gents and three ladies) and both have beautifully decorated interiors, including artwork and are fully heated. They all comprise of hot running water, hand towels and fresh flowers (which are matched to your colour scheme). Projects pinpoints of red and green lasers with the option of a blue LED background. Strips of LED lights, programmable to change colour, sense motion, or follow musical beats. For a picture perfect finishing touch that is truly magical. Available to highlight the marquee at night, especially the entrance and/or walkways, parking areas, and to illuminate features such as trees, ponds, buildings etc, for both effect and safety reasons. Ideal for lighting and decorating areas of your marquee site that are at a distance to your power supply, such as gateways and trees. These can add a splash of colour to your surroundings during the day and then soft touches of colour in the evening. 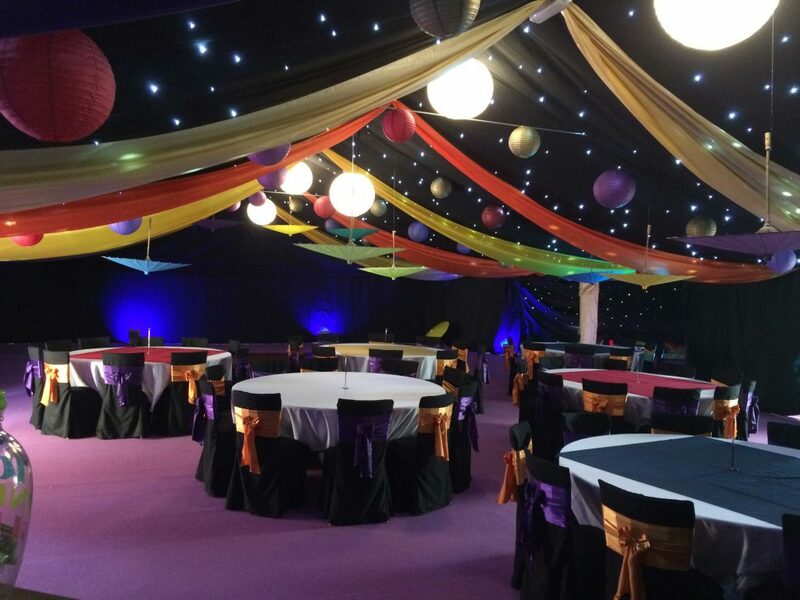 Available in a wide range of colours and sizes to compliment your colour scheme, these can simply be used to decorate the interior of your marquee, or can have the addition of individual light sources add to create a stunning effect for the evening.